There are a few really good books out this summer that detail how complicated and distorted our market’s plumbing has become. I suppose we won’t blame you if you haven’t picked up and read Broken Markets yet – after all I am pretty sure our own spouses have not read it. But please do yourselves a favor and read Scott Patterson’s Dark Pools. Dark Pools in one part details the story of a firm called Trading Machines, run by a gentleman named Haim Bodek. 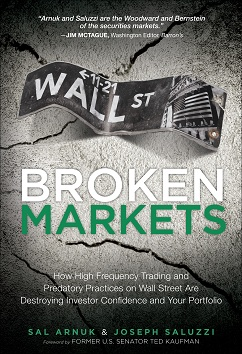 Mr. Bodek discovered what it was like to be a victim of fellow HFT quantitative firms who were using these new order types provided to them by the for-profit stock exchanges. We identify with Mr. Bodek’s tale, as should you, as we have been talking about exchange order types for many years now. You see, Mr. Bodek’s quantitative fund, Trading Machines, was engaging in HFT and was wonderfully profitable. Seemingly overnight, however, his profitable trading system had turned into a daily loss generator. It was bleeding money day in and day out. Mr. Bodek agonized night after night in his Connecticut office, going through his computer programming code hoping to find bugs he knew had to have been responsible for the bleeding. As it turned out, bugs were not his issue – order types were. He shut off trading with the exchange in question, which was responsible for most of his bleeding. Only after consulting with their tech and sales people did he realize that a new order type developed by them, with the help of some HFT clientele, was released. It allowed HFT clients to enter order flow that added liquidity only, and it also allowed them to have their orders at the top of the limit order books a much greater portion of the time. He was not using those new order types; he was not “in the know”. After that revelation, Mr. Bodek changed the coding in his system to use those order types. Voila! Profits returned. This says something rather horrible about our market structure – namely that for profit exchanges develop order types to tip the scales in favor of one group of participants at the expense of all others. Ask yourselves – if nothing else has changed in markets except for the introduction of certain order types, and those order types allow for virtually certain profitability for one class of participants, then where does that money come from? And while stock exchanges may hide behind the cloak of Darwinism, we are pretty sure that the SEC and CFTC did NOT intend for them to abdicate all semblance of fairness and investor protection. Read Dark Pools. And remember the name Haim Bodek. You may hear more from him as he tries to enlighten our regulators with a high frequency trading insider’s knowledge. ← The Markets Are Totally Fine. Really.